When 3rd Place is Good. Empowering Students in the Library. This photo, â€œFirst place, second place, third placeâ€ is copyright (c) 2009 Joe McCarthy/ gumption and made available under a Attribution-Noncommercial-Share Alike 2.0 license. One reason I love my high school ‘ library job is that I don’t have to tell people what to do all day. ‘ Sure, I’m always checking passes, giving instructions and directions, or pointing the way to obtain the desired outcome. ‘ But, when a teen walks through the doors of our school library the decision about what to do next is totally up to them. ‘ It is so unlike walking into a classroom where the next 90 minutes are highly structured and choices are circumscribed. ‘ The ability to provide an intellectually stimulating environment where teens get to make the choice of what to do next is empowering for our young people and deserves to be protected. The high school library is one of the few places where students are given decision-making power. ‘ Sure, it is the decision-making power over their own actions, but, that is where empowerment starts. ‘ When they walk through that library door, decisions await. ‘ Where to sit, computer or table? ‘ Do they need to work, or socialize a bit? ‘ Should they listen to music while they work independently, or work with a group of classmates? Do they want to work with a group of our coders on the 3D printer or lounge in a comfy chair and read a magazine? ‘ Perhaps they stayed up late studying last night and just need to take a nap. The library is one of the few places on the high school campus where students can be self-directed. The library is the third place for our teens. ‘ Described by Ray Oldenburg as neither work (classroom) or home the third place is where community building and a sense of place are fostered and nourished. ‘ I say it is also a place where youth empowerment occurs. 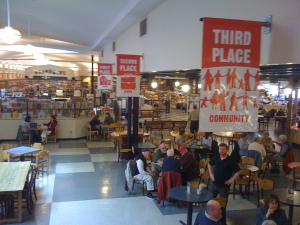 ‘ In our library, where teens have choices and can create their own culture we have helped to foster this third place. ‘ It is the place where the 3C’s of the 21st Century learning paradigm come together: communication, collaboration and creativity. In a time when school and district administrators, as well as city government, want to defund ‘ libraries, eliminate staff and cut hours it is time for librarians to show that keeping libraries open and accessible is valuable. Just because many of our students research online and our’ collections are more digital than ever, school libraries remain that third place where students can become creators rather than just consumers. ‘ School libraries and teen libraries are that place where kids can meet, create, and communicate. ‘ In fact, it is one of the few places left for students to be able to do this and we owe it to them to keep our libraries open and staffed. Nancy has worked at libraries from K-University. She is currently at home in a high school library at a top-ranked public high school in Jacksonville, Fl. (Duval County). She enjoys the challenges of her work, the teens she serves, and her colleagues. She earned her BA in Anthropology and her MA in Library & Information Studies at University of South Florida, Tampa. Besides her love of books, information and education, she is a certified life coach. She enjoys discovery, growing, and creating.